It’s widely known that our sense of smell is closely linked to our sense of taste. That’s why kids plug their noses when they eat something they don’t like, and why you can’t taste anything when you have a bad head cold. But tricking the sense of taste can work the other way, as well: smell something pleasant while you’re eating something tasty, and the experience is greatly enhanced. 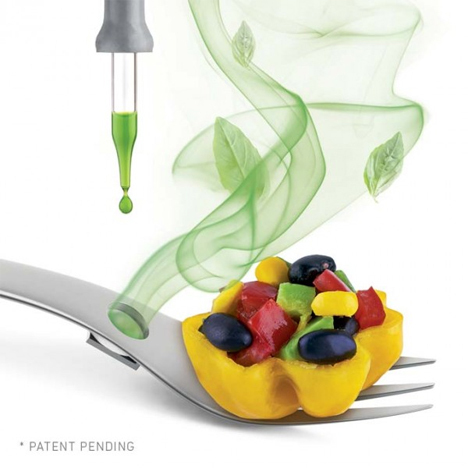 The Aromafork from Molecule-R plays on the fact that our taste buds can only recognize five basic tastes: sour, sweet, salty, bitter, and umami (or savory). 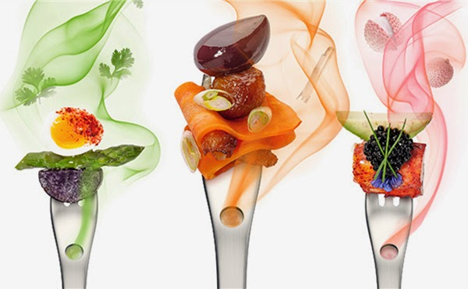 The rest of our food’s taste comes from aromas hitting the back of the palate. The Aromafork has a small, removable paper membrane just behind the tines. Adding a few drops of liquid aroma to the membrane will cause your brain to “taste” your chosen aroma along with the food you are eating. Molecule-R’s Aroma R-Evolution set comes with 21 liquid aromas: chocolate, coffee, vanilla, banana, lychee, passion fruit, strawberry, basil, cilantro, mint, almond, coconut, peanut, black pepper, cinnamon, ginger, wasabi, butter, olive oil, smoke, and truffle. You can eat your cheesecake with the aroma of chocolate hitting your palate, or go a little nuts and eat your salad while tasting cinnamon. As you eat, the liquid aromas waft up and through your sinuses, translating into the illusion of taste. If you can learn to ignore food textures, you might be able to eat healthy foods while tricking your brain into believing that you’re eating a decadent treat. 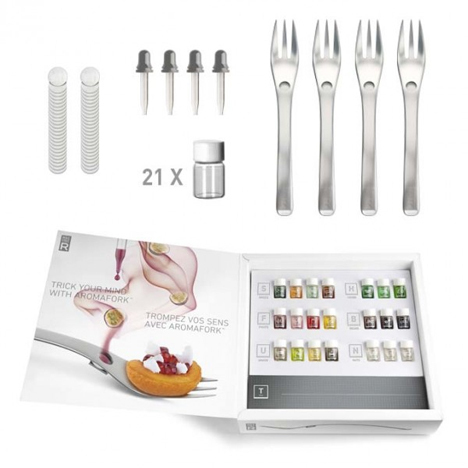 For $59 (US) you can get four forks, 21 aromas, 50 diffusing papers, four droppers, and instructions on creating your very own multi-sensory eating experience.